For the next week or so I am traveling not only over distances, but through time. As many of you know, I grew up in southern Africa, in what was then Rhodesia, now called Zimbabwe. 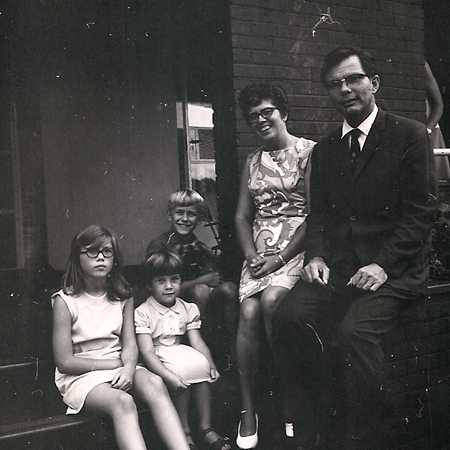 When I started at Belvedere School in Salisbury (Harare) in early 1972, my family had just moved into our fourth home in the span of two years—homes that were in four different places on two different continents. We had also lived mostly out in the bush and my mother had taught me and my brother at home. So with all the moving, not having gone to school with other kids much, and my painful (okay, neurotic) shyness, it was not an easy time for me. When a cheerful, outgoing, sports-loving classmate named Jillian befriended me I was both astonished and thrilled. Jill and I hung out at each other’s houses for hours on end talking and giggling. She was the first true friend I ever had, and her friendship brought me out of my shell a bit and helped me to find the confidence to make friends with other classmates as well. My family left Africa at the end of 1973, when I was twelve (you do the math!) and although we kept in touch for a few years after that, I eventually lost track of Jill. Over the years I have often thought about her, wondering how and where she was (many people left Rhodesia during the long years of war which ended in an independent Zimbabwe). I have Googled her countless times (although I had no idea if she had married and changed her last name), looked for her on Facebook, etc. etc. etc. So imagine my joy when I woke up to find this on my blog last month. Long story short (okay, I know, too late!) she found me—and she lives now in British Columbia, a hop and a skip away from Seattle, where my parents live. I have written about my parents on these pages before. My father was brought up in the Pacific Northwest, and when my parents retired about twenty years ago they left the corn fields of the Midwest and moved out to Seattle despite the fact that two of their three kids had settled in New England (as I always like pointing out to them, they moved as far away from us as they could get without falling in the ocean). And for many of those years they really enjoyed the beauty and outdoor activities the region offers in abundance (I have no idea why I hate being outside; I mean it’s mostly because of the bugs and weather and stuff, but it isn’t genetic for sure). For the past several years now though, my dad has been failing: he has middle-stage dementia and other issues which have rendered him practically helpless. My mother has been taking good care of him (with one notable exception) but it is very difficult for both of them. My sister, who had lived in Europe for almost 20 years, came back to the US last year and ended up in the same place (for now) as my brother and I, and so at the end of last year we asked the Beiges if they would like to move east to be with us. Long story short (again, I know, too late) they said yes. We found a place for them to live and get the care my dad needs, and like the troopers they have always been they are packing up and readying their 80-plus-year-old selves for a cross-country move (with the help of the best moving company in the world, Gentle Giant—which my father has fixed in his mind for some reason as Super Studs). Around the time that I was making plans to come to Seattle to help them with final packing and supervision of the Super Studs (not that they need it), Jill found me. As the Hindi film that could be made out of this whole long tale might be titled: Kismat! So here I am in Vancouver, catching up with my long-lost first best friend in the world. We are talking non-stop and giggling just as we used to, and it is the most unbelievably heart-and-soul nurturing thing to reconnect with someone you last saw 37 years ago and to realize that she still knows you and you still know her in all the ways that matter. Tomorrow I leave her (for now!—knowing that we will never lose each other again!) to go to my intrepid parents and take them home with me, to live near all three of their children for the first time in almost 30 years. I know it is hard for them: they are brave as they always have been in meeting life’s challenges, but it isn’t an easy thing to do. They have always nurtured us on our journeys through life and we are looking forward to nurturing them through the rest of theirs. And as hard as that is to think about, I know that I have one more person to call family again too, who will be there for me as I will be for her; who remembers the dreadful bottle-green and white houndstooth-checked school uniform as well as I do; who remembers the play in which I was the front end of a cow killed by a lion; and who remembers my mother as a practical and somewhat intimidating “American” lady, my father as a quiet and gentle man, and me as someone she could always talk with for hours. Posted on March 9, 2010 at 2:56 pm in Everything else	| RSS feed You can skip to the end and leave a reply. Its always lovely to catch up with old friends. You are so lucky to have found your first friend! Are your parents bringing THE WHEELCHAIR along with them? Will New England see some wheelchair action, now? ;-) Hope the journey and move go smoothly for all of you. congratulations! i am searching for some friends right now. i can imagine the thrill of meeting old friends after a long time. it is discovering another world and tracing another life. and who better than a friend to narrate it to you. The interwebs are so wonderful in that way…Through Jill I’ve reconnected too with other friends from those days and it’s just so much fun to piece together things from the past with the help of others who were there too. We’re hoping to have a reunion next year, although we are scattered all over the planet now, literally! you have just made a screenplay, haven’t you. yes indeed :) I am so very lucky…on all fronts. Within the last couple of weeks, I too, have had a reunion with a friend I had not seen for 30 years…thanks to the internet. It’s terrifying to think of the swiftly passing years, but comforting that, though our carcasses have aged, we are (essentially) still the same dear friends. I’m so happy for you. Ha ha! Carcasses just about sums it up! I’m so glad you found Jill! (or vice-versa) – I’ve found old friends too through the net, and made friends with people I might never have met if it hadn’t been for the net. Yay for the net! He actually still is handsome. Befuddled but handsome. I used to look like him as a kid but now I just see my mother when I look in the mirror :) Yay for the net, and yay for happy families! It is a very sweet and wonderful read ! Meeting old acquaintances from school days is a wonderful expeience. I hope I too will get to meet my school mates from 1970s and earlier. The problem is, I did not have very close friends in my school days, just normal acquaintances. The closest I have come to meeting old acquaintances was when I met a girl in 1992 in Delhi ( during a training) and we recognised each other as being in the college in the same class in 1978. She incidentally was the topper among girls in the matriculation Examination in the state of Bihar in 1978 ( that is how I knew her by name). In one earlier article, you have mentioned that after watching so many Bollywood movies, you feel like you are related to all these Bollywood actors. Likewise, I too feel the same way about you and the other regulars of this blog. As it is, I am very impressed with your parents, after reading about them. And it is so sweet of your friend that she located you and others from your class. A class reunion after nearly four decades is such a great and rare occasion. It is almost as if the clock is turned back. I am eagerly looking forward to reading about that as and when it happens. Atul you feel like family to me now too :) My parents are really special people, and I have been very lucky with my family and friends through the years. I have never been someone with a LOT of friends, but the few that I have are very solid ;-) Plus, my circle of friends has definitely expanded since I began this blog, and I am so grateful for that! Very touching indeed Memsaab getting ye olde chum/s from ye olde days of Rhodesia and Nyasaland…. now Malawi, right ? I have searched for my buddies but not much luck except for one who has been thick n thin with me all these years from High School days, we were same school, same bench, same residence, same movies buddies, still are, and that’s gonna be bearing five decades soon, a long journey and a pleasant one esp if yu can catch ’em. Here we thank the Internet or else we wud not know them either. Thanks Ash :) We Africans must stick together :))) Right there with you on the five decades too! What a wonderful story. And no, it wasn’t long. Kismat, indeed! All the bestest with the move, to your parents and you. Thanks Banno :) I’m awfully happy to have found you through the interwebs too! What more needs to be said? LYMI! Memsaab – that was a wonderful read. Glad that you could reconnect with your old friend and also that now you will be better equipped to look after your parents. Thank god for the web. Find old friends, reminisce about old times and exchange notes about old Hindi movies, what could be better. Making new friends is just as lovely as finding old ones again, it’s true. Did you sing a duet like ‘Yeh Dosti…’ when you met Jill? Wish you lots of strength and energy for the coming days! Luv you as it is, but now even more after reading this posting! Isn’t happiness found through serendipity extra sweet? And because my mind thinks in Hindi film songs, your re-discovery of a childhood friend immediately evoked the incredibly poignant “aaya hai mujhe phir yaad woh zalim” from Devar. You’re a very lucky gal, Memsaab to have reconnected with a friend and to have your parents near you. Best to all of you. I need to watch this film again. Am actually beginning to feel withdrawal on the Hindi film front :( It IS an addiction! I don’t know if this is more apropos. Like Shalini, I’m always thinking about Bolly–well in my case it’s usually a Dharam reference–Dharam during his extra garam days. And yes memsaab, when someone from the past pops up and remembers and calls you by a long forgotten name, it is very very special. My friends from middle school contacted me last November. And I met some of them (after 28 years) when I visited Madras in December. And there is a reunion this year but I won’t be able to go. But it was really good to hear the things they remembered about me when life was full of promise. It’s very nice too that all of you will be near each other even if Boston weather leaves much to be desired. Oh, it’s also from Devar and Shalini got there before me. Devar is on the very top of my list to see. It is so interesting to find out how people perceived you as a child—my memories of how I felt and who I was, and how my friends and classmates experienced me are often quite different :) Jill’s memories of my sister are hilariously and completely dead-on and essentially still accurate: a small bundle of energy, always in motion and “mouthy”, with a shock of thick dark hair (my brother and I were more blond). My sis might beg to differ, of course but I’ll leave that up to her. So are we? You look so young!!!!! A couple years off, but definitely in the same ballpark. Have a safe trip back with the parents. This is very touching. My heart is all soft and tender at the moment. I’m very happy for both of you. so are you Seeta to her Geeta or vice versa? I am mostly definitely Geeta :) I think she is currently Seeta but working on adding some Geeta characteristics to her life, as all women probably should! It’s a photo of the school choir. 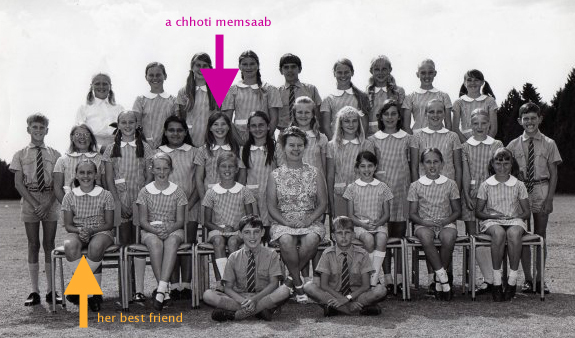 I sang in choir throughout my school years and it was always the case that girls outnumbered the boys. Not sure why, and hopefully not like that now! I see you are from Africa,all the time I thought you was an American,do you any indian blood,why, because you have become so Bolywoody, & you look so cute in the school photo group,yes the other one also. You been to Madras as well as I relatives over there. Is she astonished? Does she think ‘Where is that ‘normal’ girl I knew? Who is this strange person? LOL!! People are generally polite about my “eccentricities”…but maybe Jill won’t be. I would bet that I never appeared “normal” to anyone—I was always a misfit, an American in Rhodesia, and a Rhodesian in America. @ Pacifist: Jillian thinks that it is wonderful & inspiring to be friends with someone who has such an intense, heartfelt passion for something, & who is willing & able to share that passion with others, reaching out across physical & cultural distances in the process. The world needs more passionate people, because they remind us of what life SHOULD be like, not how so many of us end up living it, & give us the courage to change. The object of the passion is less important than the fact of it, because the energy it creates is infective & positive: that’s why you all follow the blog! You are all to be admired & congratulated for your passion – don’t be shy about it! Memsaab (love that title!) may have considered herself a “misfit” but to us – children of British Colonialism living in a country under international siege & at war with itself, & raised within all the stoicism, “stiff upper lip”, & conformity that required – she was exciting & exotic, & a totally normal 10 year old in a new school! Not to mention a fun, thoroughly nice person who was, & still is – again – an excellent friend to me! You could ask any of those who knew Memsaab back then what they remember, & they’ll say “Her smile!”. I knew Memsaab as an incredible artist, & I can believe the colour, spectacle & drama of Hindi movies & Indian culture generally would strike a chord in the artist in her, so perhaps the area of passion is not too surprising! Most people think I am just off my rocker, though, Pacifist. Seriously. >the energy it creates is infective & positive: that’s why you all follow the blog! Like your journeys esp when the end result will be to have your parents near you :))) that is a big smile. And all the lovely photos: and the school uniform. In return, my bloggy sister has scanned the painting whose anecdote I have related somewhere on your posts I think. yes, thats a painting by an amateur painter. This was a very touching post. Glad that you are going to have your parents close by – Very happy for you for that and for having found Jill!!! It’s so wonderful to come across old friends. As you said, it’s so interesting to find out how people perceived you as a child. And thanks to the internet for re-uniting long-lost friends and bringing back all those fond memories. Though I knew about your trip to Seattle/Vancouver, I am reading this only now. It is a very sweet post – straight from the heart (as most of your posts are). Am very glad you could reconnect with Jill and other friends from many many years ago. It is a very special feeling, no doubt. I had the same when I visited New Delhi recently and met up with school classmates of over 32 years ago. The Internet is so wonderful – it has made the world such a small place. You reconnect with old friends, you make new friends..just great !!! Well, my mom and dad are getting settled into their new home and seem to be adjusting all right, although the chaos tires them out more than it did twenty years ago :) It is awfully nice to have them here too! Y3eYeah! Ultimately only the people who witness our lives matter.